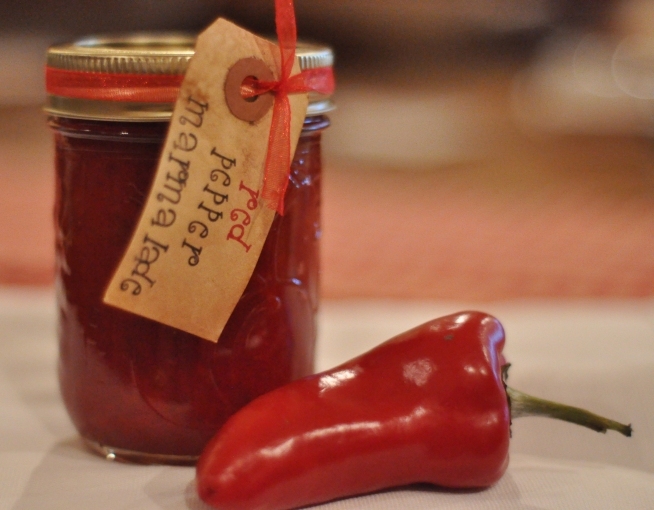 We had an abundance of red peppers and I was looking for something different to do with them when I came across this recipe for red pepper marmalade in Stocking Up. I received this canning book and several others from my sister for my birthday (thanks sissy-lou) so I was excited to give it a try. Cover peppers with boiling water; let stand for 5 minutes; drain. Repeat, and drain well. Put through coarse blade of food processor. (I used the finer blade) The mixture should measure about 4 cups. Put whole allspice in a spice ball or tie in a jelly bag. Combine with other ingredients. Boil for 30 minutes, stirring occasionally. Let stand overnight. Next day, bring to boil in large saucepan and simmer for 10 minutes. Ladle boiling hot into sterilized 250mL jars leaving 1/4″ headspace. 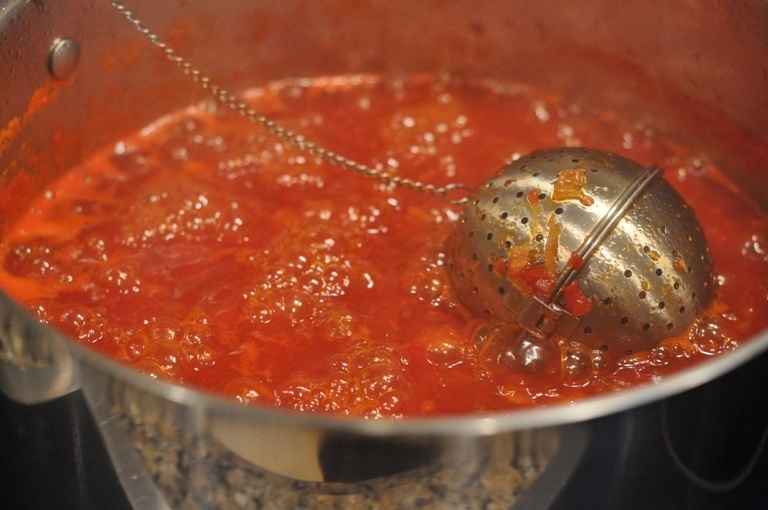 Remove air bubbles and adjust headspace, if necessary, by adding hot marmalade. Wipe rim. Center lid on jar. Screw band down until resistance is met, then increase to fingertip-tight. Place jars in canner, ensuring they are completely covered with water. Bring to a boil and process for 10 minutes. Remove canner lid. Wait 5 minutes, then remove jars, cool, label and store.